Human Resource Accounting | Business Article | MBA Skool-Study.Learn.Share. Nowadays many organizations like to emphasize on gaining a competitive advantage in the market. The advance equipments, new technology, good marketing strategic, excellent customer services and many other elements can be the factors to build up for the advantages. 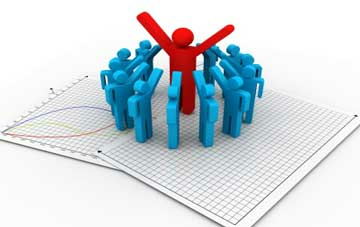 However, human resource is still the most important element to determining the success or failure of an organization. Without their support, the organization daily business function will not be done well and ready. Human resource is always related to one organization profitability and their ability cannot be replaced by machines. The skills, knowledge and experience of each individual contribute to the growth of organizations, communities and nations. Such valuable human talent can be thought of in terms of human capital and is one of the primary requirements for national economic development. Strategic human resource management is playing an important role as organization development in today’s competitive market. Organizations recognize the importance of focusing on the human factor to contribute ideas in order to improve the productivity. They design the recruiting plan to approach talent peoples, training and develop them in order to perform those competencies. The organization put in affords to meet the expectation of the employees so that create a workplace atmosphere among the employees. Ironically, while human resources are the most important asset in an organization, they are also the cost involved during the training activity. The organization suffers the cost if they employed the wrong candidate for the job. Such costs can be calculated in direct and hidden cost. Direct cost can be considered as recruitment advertisement, conduct new training for new staffs, medical check up and so on. Also, the company will found the hidden cost in such that way of lower morale among old employees. According to traditional accounting researchers, they should not support to human resource accounting. Because of they think like that human resource accounting cause more difficulties in accounting process. That’s why they should not support the human resource accounting. According to modern accounting researchers, they should support to human resource accounting. Because of they think like that human resource accounting back bone of any organization and also every asset created by them. So why should not show human resource as an asset in accounting process. Programming policies and programs for the development of human resource. Decision regarding cost reduction program. Man power planning and control. Conservations and reward of human resource. Making a choice of between various types of human investments and investment in other assets. The human resource costs are 3 types. The cost incurred up to the stage of reporting for duty of employees normally called Acquisition cost. It includes like advertising, application processing, screening, conduct test, interviews, and remunerations. The cost incurred from the time of reporting for duty to stage of placing the person. So recruited on the jobs are normally know as development cost. This cost comprised salary of the trainers, the cost of study materials, consultancy fee, and a share of administration expenditure. Periodic payments to the employees after they are recruited and assigned with specific work may be called operational wages and salaries. This cost includes employee’s contribution towards the employees, insurance and provided fund. Human resource accounting basically had two methods i.e. Human resource cost accounting also includes some methods such as, Historical cost method, Replacement cost and competitive bidding method. Human resource value accounting also includes, some methods such as, jaggy and law method, Net benefit method, Economic value method, Present value of future earnings, and Adjusted discounted future wages method. I was did research on how to treat human resource as an asset of an organization. According to my research, When you treat human as a asset we have to conceder some points I.e. normally all costs of relating human we shown debit side of the trading and profit&loss account. Dr. TRADING AND PROFIT & LOSS ACCOUNT Cr. The article has been authored by Kalyanam from Emeralds Advanced Institution of Advanced Management Studies, Tirupati. Is it Time to move on from Bell-Curve Performance Appraisal?